True Cause is the true cause. Lucky, so lucky. I love you. These are the phrases that fifteen-year-old Elinor has grown up with on the farm where she and her fellow Followers, led by the amazing Howard, live. It is a simple, material-less lifestyle, but Elinor is one of the Chosen, a special group of young girls who will go on to a very important role in her community, as one of Howard’s many brides. Importance is focused on the soul and not the outer body, and Elinor should be happy, so happy.However, she is not. As Elinor sees more and more of the odd things that happen on the farm—such as when Meryl, a fellow Chosen, was tied to a tree to be whipped and then disappeared from them forever without notice, or when Howard pretends to drown a woman’s baby as a warning—she struggles against everything she’s grown up with.This conflict between her community’s teachings and her inner voice grows stronger when she meets Jamie, a familiar-looking outsider boy who makes her stomach do flips in ways she just knows is dangerous. 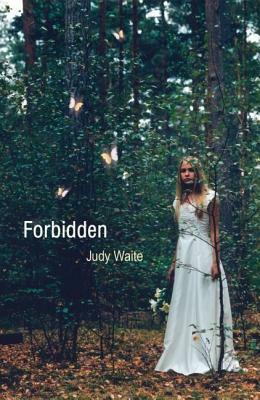 She cannot stay away from him, however, even though the only one who can ultimately save herself from the increasingly dangerous world she lives in is herself.FORBIDDEN takes an interesting concept and spins it into a thrilling story. It’s sort of a psychological thriller in an eerie alternate world, dashed through with a bit of romance. A good read for dull moments. This was okay. It was definitely an easy read and it was what I was looking for to read. I'm glad Elinor got out alive and got to be with Jamie. I figured out that the whole thing wasn't orchestrated by Howard, he was merely a puppet in that guy's (I don't remember his name but he was Howard's high adviser) plans. I still wonder though what happened to Meredith, Isabel, and Elinor's mother and if they ever find them. I love bigamy books only because I like reading about the tough things they go through and things they believe. This one is very good. The vivid words Judy uses make me image the parts so well. I was almost there in the book. My favorite part is when Elinor finally thinks for her self. True Cause is the true cause. The first time I saw that book in our school library, it already got me curious. Other than a very alluring title, I also read the short summary which caught my interest as well. I am curious about mysterious, psychological genre on books especially this one which contains some cult-related things. I usually go for the romance, drama or comedy novels.So the book was about Elinor, a girl who had been in a group called True Cause. To her it seemed like a way of normal life for all of them, who were a member of that certain group. It was weird how taboo True Cause can be. The members have some sort of practices and beliefs that are way too bizarre for the normal people or the 'Outsiders' that they call.Apparently Howard Reiki is a psychopath who thinks he is a God of his own religion that is why he created True Cause and brainwashed people who joined his group. Elinor didn't know that she was actually an outsider too. All of them were.Her memory wouldn't have been triggered if it weren't for Jamie. I loved that Jamie was a part of her past and that he saved her in the end. Interesting, but not completely engrossing. 15-year-old Elinor has been raised in a cult somewhere between Mormonism and Scientology. The first person narration believably depicts a cult members mentality and the breakdown thereof (to my inexperienced self anyway). However, while I feel other horrors of the cult were given adequate gravity (undernourishment, emotional abuse, economical manipulation) the fact that Elinor is “married” to and raped multiple times by the cult’s leader relatively downplayed. This is on my shelf at school as a novel set & the back blurb sounded interesting. Unfortunately, it fell very short of my expectations. There was a lot of potential for suspense and character development, but all 3 main characters were rather one-dimensional. As a previous reader stated, it had a very dated feel - so much that I checked the copyright date more than once. Possibly an earlier manuscript that did not get submitted until decades after it was written? It is a short book that has little to recommend it. I would pass it up & reach for something else with more meat to it. Overwhelmingly lame. The main character was really interesting but the plot was paper thin and just way too pat. And cults? What is this, the 70's? There was something about this book that just had such a dated feel to it. It made Emily such a simple character, and not simple good, but simple "I'm too lazy to flesh her out and make her a real teen so you get this thin crappy good girl substitute". If you are bored to tears, you might want to pick it up, but it was not very good. This book is really good. I zoomed right through. Finished it in a day. At first I was wondering why they kept repeating words twice but then you figure out that it's her way of questioning things. Cults are a horrible thing. Especially this one. He has 15 wives and the main character is next. He sleeps with each one whenever he wants and he's in his early 70's mid 60's. It's quite distrubing but great book. This was a short book and easy to read - a lot of repetition, as it was "from" the mind of a brainwashed girl in a cult. It's scary how this is presented, you know it happens more than we like to think, but how easy it is for "outsiders" to see what is going on while those inside think that they are doing the right thing. Anyhow, it was a good book. Examines a cult. I felt that it was done pretty well, except for one thing - they kept taking in people from the outside, and yet the girl never questioned where she came from (parentage, etc.). That seemed a little strange to me. Still, it was good. Maybe I'm just a sucker for stories about cults. This is a very quick read in which a young girl is in a cult compound which crosses a Warren Jeff's fundamentalist fringe Mormon stronghold with Scientology. Our protagonist is earmarked to become a bride of the lunatic prophet, and is one hundred percent on board with that, until memories from her past come clouding in. This book gives you a riveting and mind searching look at what life could be like. Set in modern day England follow Elinor, a member of the cult True Cause, and see what happens to her daily. What would it be like if you had only known one thing your entire life? If you only lived for the end of the world? If you found out it was all a lie…and you couldn’t escape. Elinor is lucky, so lucky, to be one of the Chosen in the True Cause, safe from Outsiders. She is Saved, when the Endtime comes. But believing isn't as easy as it once was, and now she's met a young Outsider her own ange, with moss green eyes who reminds her of memories she didn't know she had. Will Elinor remember in time? An inside look at a cult with a sympathetic character. Fifteen year old Elinor is one of the Chosen, who when she turns 16 will become one of Howard's brides. The reader gets a real sense of the power of a cult and I think it is very well done. This is a creepy little teen book about a girl who grows up in a cult. After befriending an outsider, she starts to question the whole cult mentality (Bad Thoughts!). It's often awkward but appealing in a voyeuristic/after-school special sort of way. This story was really interesting and good. I'm glad Elinor was rescued by Jamie and got away from that cult. No one should live the way she did. I felt so bad for her and the people who were brainwashed over there. Forbidden is about a teenage girl who was recruited into a cult at a young age. It is an interesting story, but it seems to work out too easily to really be compelling for the reader. I recommend The Chosen One by Williams instead, for readers interested in this topic. Very odd concept but they relate it to religions across the world near the end which was insightful. An interesting look into a Cult...I especially like the ending, which seems a little ambiguous - does the Cult continue with a new leader? or will Elinor save those that are lost? hmmmm. This book was very slow for me. I think that I would have liked it better if it had less about the kuh-ree-pee cult and more about what happened afterwards..... The repetition drove nuts. Really gripping book. I read it in one day. I really enjoyed this book because Ms. Waite got it right. This is how brainwashing works. I should know. I was raised on it.